The late Rosser Reeves, former CEO Ted Bates Advertising. In 1961 Rosser Reeves, the Creative Director of Ted Bates Advertising, Inc., wrote a book titled Reality In Advertising. Although it’s now out of print, you may be able to find a copy at a used bookstore or a library. Reeves was the man who created “I Like Ike,” “Melts in your mouth, not in your hand,” and the famous Anacin ad with the tiny bubbles carrying relief to boxes in a silhouette head. Are you familiar with our advertising? Do you use our product? He put the tallies into a grid much like this one. Please appreciate the elegant simplicity of this test. The left side is made up of people who are familiar with your ads. As a percentage of the total, these people represent your MARKET PENETRATION. The higher your Market Penetration, the better your advertising is working. The lower your score, the greater potential for increased sales with a good advertising campaign. The top side is made up of people who buy what you have to sell. If ten percent of the unpenetrated group buys your product, and twenty percent of the penetrated group buys, you may subtract the first group from the second to get what Rosser Reeves called the “Usage Pull” of your advertising. Today it’s better known as the CONVERSION FACTOR. Thankfully, we don’t see it often, but it is possible to have a negative Conversion Factor. This is evidence that your advertising is actually harming sales. Should you find yourself in this situation, STOP YOUR ADVERTISING IMMEDIATELY and get help. Reeves techniques are nearly half a century old, but they still work exceptionally well. If you can find a copy, Reality In Advertising deserves a place in your marketing library. Consider it a guidebook to go fishing for customers. Have questions about whether your advertising is drawing customers? Drop Chuck a note at ChuckMcKay@ChuckMcKayOnLine.com. Or call him at 304-208-7654. The public simply calls them lies. The practice of puffery is so common in advertising that according to the 2008 Edelman Trust Barometer Survey, only 20 percent of respondents trust corporate or product ads. Believe it or not, this information will effect the outcome of Ralph’s new test of his advertising. At least, it would if Ralph had been paying attention. Let’s talk about Ralph. He owns an appliance store. He purchases four cases of Del Vecchio cappuccino makers from China. Ralph places an ad in the newspaper explaining that after the Del Vecchio cappuccino maker brews up to four cups of espresso in it’s glass carafe, its swivel jet frother will make steamy, frothy milk for cappuccino. The ad boasts that Del Vecchio cappuccino makers are available this weekend at Ralph’s Appliances. Not at the $89.95 one would expect to pay for an appliance of this quality, but rather for only $34.95. But Ralph doesn’t display those $34.95 cappuccino makers. When the ad hits the newsstands, the cappuccino makers are still in Ralph’s back room. Ralph wants to know who’s coming in to his store as a result of his ad. He has concluded that the only way anyone would know about the cappuccino makers would be from seeing his newspaper ad. Therefore, if Ralph forces customers to ask for the item, and tallies the sales, he believes he’ll have a fair test of the effectiveness of that newspaper ad. He’s not testing the advertising at all. What Ralph is measuring is a customer’s willingness to ask for something she doesn’t see on display. And he’s limiting that test to those who’ve see the ad and come to the store looking for a specific product. Will shoppers ask for items they don’t see on display? Some surely will. Most will look for a Del Vecchio cappuccino maker, and not finding it, will simply leave without making a purchase. They will also tell their friends not to believe any ads from Ralph’s Appliances. So, if forcing shoppers to do things they don’t want to do is a bad test, how does a manager/owner determine the effect of advertising on a specific sale? Check the day’s total sales, and compare to yesterday, last week, and last year. Any significant change in trending can be assumed to be the result of some outside influence. Barring any other influences, we can assume the advertising was the primary factor. Chuck McKay is a marketing consultant who helps customers discover, and choose your business. Questions about testing your advertising may be directed to ChuckMcKay@ChuckMcKayOnLine.com. The only Chevrolet dealer in Smallburg,Texas, augments his local newspaper ads with a schedule on a regional radio station licensed to the adjacent community, Midville. He’s been selling an average of 18-20 cars per month. At the end of his first month with the new radio station he has sold a total of 27. Ned thinks advertising cause and effect is common sense. Is it? Yeah. Most of the time it is. In this case, I’d bet that Midville’s regional radio station has listeners in Smallburg. How many? At least seven. At least seven that were ready to buy new cars. Since no other part of the advertising mix has changed, we can pretty well determine what drove the increase. The key is to test only one change at a time. Then watch the outcome. Sometimes it’s not what anyone might expect, but it’s usually still common sense. An apartment complex which does a very credible job of tracking the source of each lead has just added radio ads to their marketing mix. I advised them to watch for an increase in ALL of their lead sources. 1.Realtors, hearing the ad, will naturally think of this complex more often. We can expect them to recommend it more than they might have without the reminder. 2.People hearing the ad are likely to look up the phone number of the complex in the Yellow Pages. We can expect Yellow Pages referrals to increase. My favorite advertisers intuitively know this. They change headlines, and record the response. They change insertion days, and record the response. They add the weekend edition, and record the response. 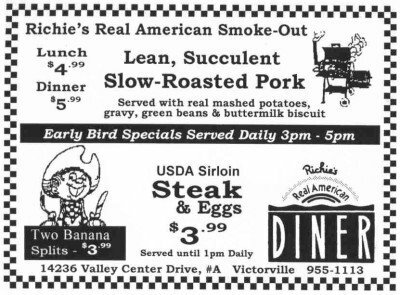 Roger de la Paz of Richie’s Real American Diner in Victorville, California knows that this particular ad delivers a consistently predictable 118 percent increase in gross sales every day it runs. How? Because he’s already tested everything from ad size, to offer, to headline, to graphics, to the day of the week to run this ad in the Victorville, Ca. Daily Press. Roger systematically changed only one element at a time, and kept careful records of each outcome. He compares the demand for specific food items before the ad runs, and again afterward. He is then able to calculate the increased demand for specific menu items against the cost of the ads. There are no quick answers. Each test helped Roger to make each successive ad more profitable. It took him three years to learn what he now knows about advertising his restaurant in the Daily Press. But by carefully tracking the specifics of size, placement, and frequency of his newspaper ads, Roger can now predict to within a few dollars the ROI for each newspaper ad he runs for Richie’s Real American Diner. Persistence, it appears, is also a key element in testing your advertising.